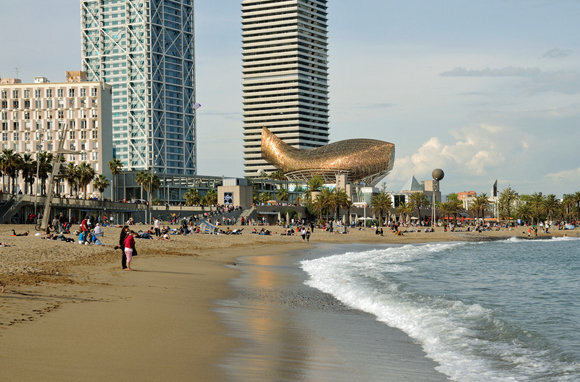 You simply cannot visit Barcelona in the summer without spending some time walking around the beautiful seaside town of Barceloneta. Its long stretch of golden sand (named ‘third best beach in the world’ by the Discovery Channel) is a great place to relax or enjoy some fun water activities, while the area’s quirky artwork, buzzing nightlife and delightful seafood restaurants make this area a hit with locals and tourists alike! Some of the best beach apartments in Barcelona are located in this colorful ‘barrio’, and many people choose to stay right on the seafront to truly get the most out of their Mediterranean experience! 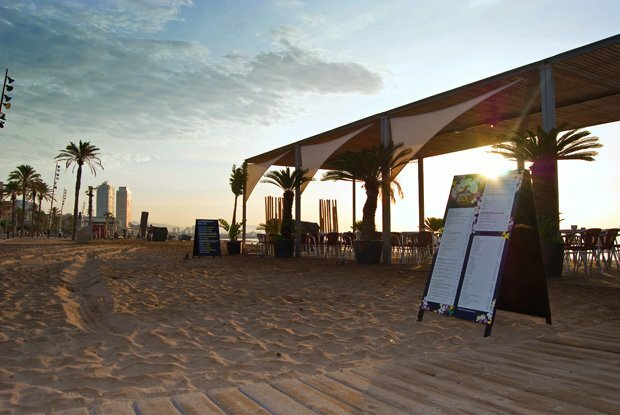 With everything to offer from some of the most popular ‘chiringuitos’ and beach bars in Barcelona, to table tennis and volleyball courts, to sun loungers for those who wish to simply unwind, Barceloneta beach is the perfect place for a day under the Spanish sun! 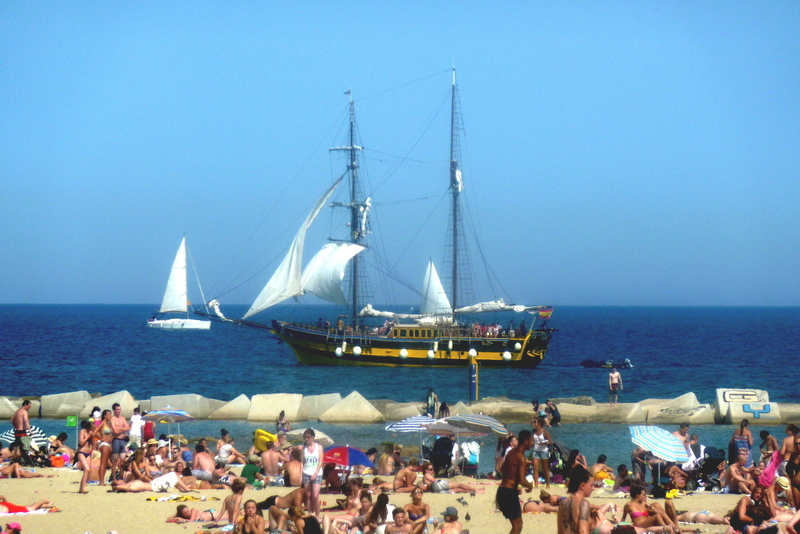 As one of the most popular strips of sand in Barcelona, this beach gets quite crowded during the summer months, so be sure to grab your sunscreen, towels and beach balls and head down there early, or you may find yourself without a spot to claim! 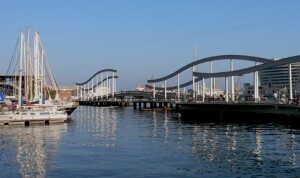 Barcelona underwent a major revamp in preparation for the 1992 Olympics, and consequently most of the distinguishable art to be found along the coast was designed for this major sporting event. 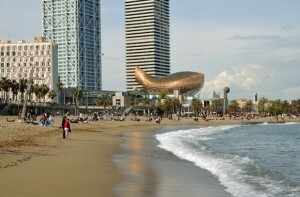 From the famous ‘Golden Fish’ by Frank O. Gehry, to the memorable ‘Estel Ferit’ cubes by Rebecca Horn, a stroll along the Barceloneta promenade offers visitors inspiring alternatives to the Gaudí works that can be found all over the Catalan capital. Though not considered to be in the center of the Barceloneta neighborhood, but lo cated on an artificial island in the nearby Port Vell area, the Maremagnum Shopping complex is an essential stop for those in need of some retail therapy. This shopping haven hosts more than 50 stores offering everything from souvenirs to swimsuits. If your taste buds have been tickled by the incredible cuisine to be enjoyed in Barcelona, and you feel the need to try out some Mediterranean inspired dishes yourself, then head to the Mercat de la Barceloneta, located in the center of the neighborhood, where you can browse the stalls offering the freshest ingredients for your dishes! If you’d like to see the whole area and more, and get your blood pumping at the same time, our suggestion is to rent a bicycle from one of the many stores in the area, including Barcelona Rent a Bike on Passeig de Joan de Borbó. Opt for a guided tour of this ‘barrio’, or simply pedal at your own pace. Though the area may be best known for its beautiful strips of sand, this quaint neighborhood is also home to some of the best seafood restaurants in Barcelona. From the freshest fish to the most delectable paella, Cal Pinxo, located on the beachfront is ideal for those who seek a memorable dining experience. If you wish to just nibble on a little bite, then make your way to Jai-Ca tapas bar on C/ Ginebra. With endless Spanish snacks and ice-cold refreshing beers, this spot is perfect for those looking to eat on-the-go in an authentic setting. 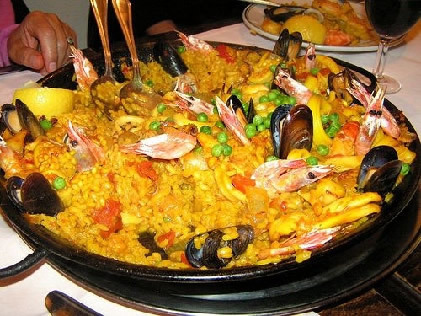 If you are up for an adventurous meal, then we suggest Somorrostro restaurant. Located on C/ Sant Carles, this eatery offers an unusual variety of fruit inspired dishes, such as Kangaroo with mango compote. Go on, we dare you! 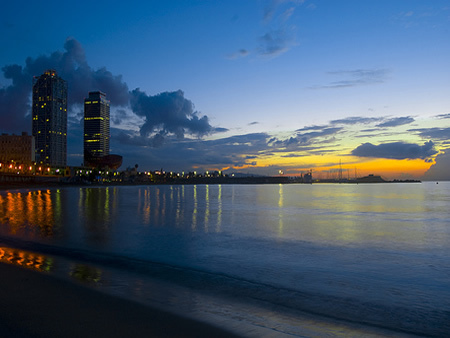 Known for some of the best nightlife in Europe, Barcelona is home to many bars and clubs, and some of the most notable are to be found on the Barceloneta promenade at the Olympic Port. Some of the more famous venues include Opium Mar and Danzatoria, both offering a wild atmosphere, and both ensuring a memorable night out! The spot for Barcelona’s beautiful people is undoubtedly Shôko! 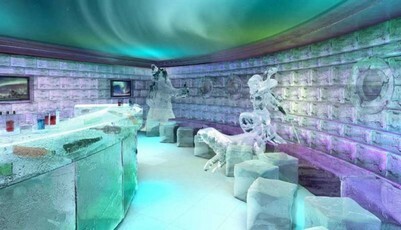 This chic venue is a top-class restaurant by day, an exclusive lounge during the evening, and after the clock strikes midnight, it becomes the most sought after place to be in Barcelona. So, if you are heading to Barcelona this summer, make some time for one of Shôko’s amazing beach parties! If you wish to sit by the Mediterranean while enjoying some drinks in a laid-back atmosphere, then the chiringuitos of Barceloneta await you. Best described as beach shacks on the sand that serve drinks and snacks from the morning until the wee hours, there is no better way to kick back and relax in the presence of friends or loved ones. One of our favorites is Chiringuito de Sol, with reasonable prices and mesmerizing views of the sea! 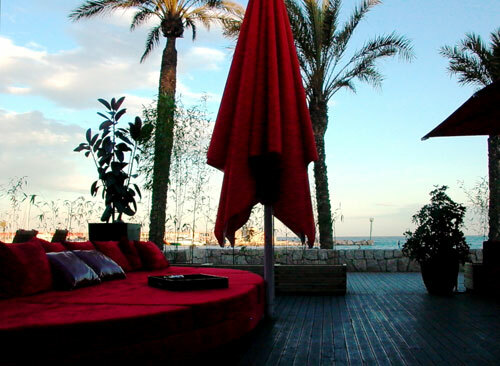 To experience all the very best on offer in the Catalan capital, including delicious delicacies, memorable sights and an enticing nightlife, not to mention the beautiful beach, why not rent an apartment in Barceloneta and experience it all, everyday? How to get to Barceloneta: Take the L4 (Yellow Line) to the Barceloneta stop, or any of the following buses 14, 16, 17, 39, 40, 45, 51, 57, 59, 64 and 157. This entry was posted in Bars & Nightlife, Places, Restaurants & Food and tagged areas in barcelona, barcelona, barcelona art, barcelona attractions, barcelona districts, Barcelona food, barcelona food and drink, barcelona neighborhoods, barcelona nightlife, barcelona restaurants, Barcelona shopping, barcelona tourist guide, barceloneta, clubs in barcelona, port olimpic barcelona, summer in barcelona, travelling around barcelona. Bookmark the permalink.